We are delighted to welcome you to our website at Daniel’s Music Foundation and to give you a brief overview as to why we started DMF, as well as an introduction to our mission and programs. When one of Daniel’s 5 undetected brain aneurysms unexpectedly ruptured at the age of 12, our family was in “crisis and triage” mode, doing everything possible with the help of so many, for him to survive another day. As he emerged from his 30-day coma and began to stabilize over that initial two-month period, he started a regiment of intense therapies to bring back as much functionality as possible. After almost one year, he came home. He was different and our family was different but we started a journey that was focused on love, acceptance, the setting of achievable goals and looking for that one spark that would provide meaning to Daniel’s life. After 8 long years of searching, Daniel found that one thing, his “super power” – music. As we researched the power of music and programs that were available for individuals with disabilities we found there was a void. There were conservatories that focused on music performance and excellence and music therapy but there didn’t seem to be anything in between. And there were no programs available for individuals with disabilities in a group setting. It was with that realization that in 2005, we decided to start Daniel’s Music Foundation. Our programs would be based on acceptance, respect and socialization wrapped around the one universal language in the world – music. We wanted to celebrate diversity and provide a community for individuals with developmental and physical disabilities from ages 3 to adult. We would use music to allow our musicians to learn new concepts while expressing themselves and sharing their talents with others. Recently, we started a new program, the Diversity Awareness Through Music Initiative which brings music, education and the talents of our musicians out into the general public. The program promotes appreciation, respect and understanding, so that we can live in a more harmonious society. It has been a long road, and we have so much to be thankful for. We are fortunate to be surrounded by wonderful musicians, generous donors, a strong board and an incredible management team, staff and group of volunteers. We have learned much from all of them as well as from our own personal experiences and look forward to continuing this beautiful, unforeseen journey. We hope this website conveys our principles, as well as the programs and the community that Daniel’s Music Foundation represents and serves. And finally, we hope you are able to join us in our various programs and celebrate the many talents of our musicians and community. If you would like to learn more about our journey, please see the videos below, as well as a link to a book written by New York Times best-selling author Jerome Preisler, for which we are most grateful. From the bottom of our hearts, we thank you for your interest. Enjoy the official video from Daniel and Ken's recent TEDxBroadway talk about how Daniel's Music Foundation came to be, plus a special performance by Daniel and our Music Director, Gerry Powers. Filled with passion and spoken from the heart, be prepared to laugh, cry and learn about a promise that was made over 20 years ago. Daniel's Music is the gripping story of Daniel's recovery against odds experts said were insurmountable; of medical science, faith, and perseverance combining for a miracle; and of an average family turning their personal trials into a force that brings joy, inspiration, and a powerful sense of belonging to all those whose lives they touch. 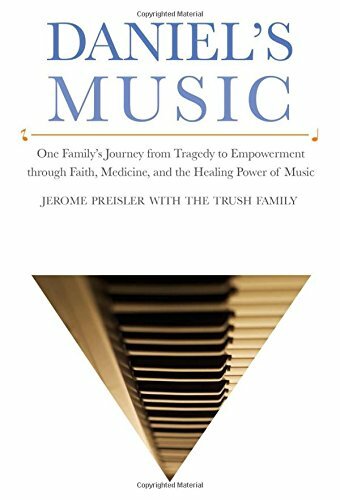 Written by New York Times bestselling author Jerome Preisler. Hear the story from the Trush family when Daniel first came home from the hospital over twenty years ago.